Ali Al’Amin Mazrui, 81, died peacefully on October 12, 2014 of natural causes at his home in Vestal, New York, surrounded by family. A political scientist, Mazrui was the Albert Schweitzer Professor in the Humanities and Director of the Institute of Global Cultural Studies at Binghamton University, State University of New York, until his retirement on September 1, 2014. He had also been serving as the Andrew D. White Professor-at-Large Emeritus and Senior Scholar in Africana Studies at Cornell University and as the Albert Luthuli Professor-at-Large at the University of Jos, Nigeria. He was a renowned scholar, teacher and public intellectual with expertise in African politics, international political culture, political Islam, and North-South relations. His prolific writing over the past half century has shaped ideas about Africa and Islam among scholars and the general public, earning him both international acclaim and controversy. He authored over forty books and hundreds of scholarly articles and book chapters. His political analyses appeared frequently in news media around the world. He is best known for the nine-part television series he wrote and narrated, “The Africans: A Triple Heritage.” A joint production of BBC and PBS, the series originally aired in numerous countries in 1986. The series, and the book on which it is based, reveals and analyzes the complex ways in which African communities exhibit a blend of three cultures: indigenous, Muslim and Western. Mazrui’s own upbringing reflects this triple heritage. He was born on February 24, 1933, in Mombasa, Kenya, to Swafia Suleiman Mazrui and Sheikh Al-Amin Mazrui, an eminent Muslim scholar and the Chief Qadi (Islamic judge) of Kenya. Immersed in Swahili culture, Islamic law, and Western education, he grew up speaking or reading Swahili, Arabic and English. He pursued his higher education in the West, obtaining his B.A. from Manchester University in England (1960); his M.A. from Columbia University in New York (1961); and his doctorate (D.Phil.) from Oxford University in England (1966). While studying in England, he married his first wife, Molly Vickerman, and they began a family in Kampala, Uganda, where he launched his academic career at Makerere University. He taught at Makerere for ten years, during which his first three sons were born: Jamal (1963), Alamin (1967) and Kim Abubakar (1968). At Makerere, he served as head of the Department of Political Science, Dean of the Faculty of Social Sciences, and Dean of the Faculty of Law. During his tenure at Makerere, dictator Idi Amin became increasingly repressive toward critics, ultimately forcing Mazrui into exile with his family to the United States. Mazrui’s career in the US began at Stanford University, where he visited for two years (1972–74). He then joined the Political Science Department at the University of Michigan for seventeen years (1974–91), where he also served as Director of the Center for Afro-American and African Studies (1978–81). In 1989, the State of New York recruited him to Binghamton University to assume the Albert Schweitzer Chair in the Humanities, previously occupied by Toni Morrison. At Binghamton, he founded the Institute of Global Cultural Studies and regularized his at-large affiliation with Cornell University. In 1991, he married Pauline Uti of Jos, Nigeria. They had two sons, Farid (1992) and Harith (1993), and adopted a daughter Grace (b. 2004) in 2012. Mazrui’s publications are influential and voluminous. He made his mark early in his career, before completing his doctoral studies, when in 1963 he published articles in the most prestigious political science journals in the United States and Britain: “On the Concept of ‘We Are All Africans,’” The American Political Science Review (Mar. 1963) and “Consent, Colonialism and Sovereignty,” Political Studies (UK) (Feb. 1963). His many books began with the publication of three in 1967 alone: Towards a Pax Africana: A Study of Ideology and Ambition (1967); On Heroes and Uhuru-Worship: Essays on Independent Africa (1967); and The Anglo-African Commonwealth: Political Friction and Cultural Fusion (1967). Other Mazrui books include A World Federation of Cultures: An African Perspective (1976); The African Condition: A Political Diagnosis (1980); Cultural Forces in World Politics (1990); Islam Between Globalization and Counterterrorism (2006); and African Thought in Comparative Perspective (Seifudein Adem, Ramzi Badran & Patrick Dikirr, (eds. ), 2014). The African Condition also formed the basis of the prestigious annual Reith lectures that Mazrui delivered in 1979 for the BBC. His book, The Power of Babel: Language and Governance in Africa’s Experience (co-authored with nephew Alamin M. Mazrui) (1998) was launched in the British House of Lords at a ceremony honoring Mazrui’s work. He and Alamin M. Mazrui also published Black Reparations in the Era of Globalization (2002). The project stemmed from his appointment in 1992 as one of twelve Eminent Persons by the Organization of African Unity Presidential Summit in order to explore the modalities and logistics of reparations for enslavement and colonization. He also published a novel, The Trial of Christopher Okigbo (1971), which was inspired by his anguish over the Nigerian Civil War and the tragic death of a childhood friend, Mohamed Salim Said (nicknamed “Giraffe”). For an annotated bibliography of Mazrui’s work, comprehensive to date of press, see The Mazruiana Collection Revisited (Abdul S. Bemath, (ed. ), 2005). Books containing scholarly papers about Mazrui’s work include The Global African: A Portrait of Ali A. Mazrui (Omari H. Kokole, (ed. ), 1998) and the Politics of Global Africa (Seifudein Adem, (ed. ), 2011). Mazrui served in numerous capacities in addition to his primary professorships. He was a visiting scholar at Australia, Baghdad, Bridgewater, Cairo, Chicago, Colgate, Denver, Guyana, Harvard, Leeds, London, Malaysia, McGill, Nairobi, Ohio State, Oxford, Pennsylvania, Singapore, Sussex, Teheran, UCLA and Washington. Kenyan President Mwai Kibaki appointed him Chancellor of Jomo Kenyatta University of Agriculture & Technology in Nairobi, Kenya, a position he held for six years (2003–09). He was awarded honorary doctorates by several universities in such varied disciplines as Divinity, Sciences of Human Development, Humane Letters, and Political Economy. He also served in leadership roles in several organizations, including as President of the Muslim Social Scientists of North America and President of the African Studies Association of the United States. He also served as Chair of the Board of the Center for the Study of Islam and Democracy and as Special Advisor to the World Bank. Mazrui was a principal contributor to several United Nations projects on matters of global significance, such as human rights and nuclear proliferation. He served as editor, for example, of Volume VIII (Africa since 1935) of the UNESCO General History of Africa (1993), and as Expert Advisor to the United Nations Commission on Transnational Corporations. Mazrui was also a gifted teacher and orator. His passion, eloquence, and charisma as a lecturer filled classes throughout his teaching career. Similarly, his reputation for insightful analysis and moving oratory created standing-room only audiences at public speaking events throughout the world. Indeed, his “Millennium Harvard lectures” drew large, engaged audiences for three consecutive days. (The lectures were subsequently published as The African Predicament and the American Experience: A Tale of Two Edens (2004).) Mazrui was, moreover, deeply dedicated to his students. One of the things he regretted most about his declining health was the inability to meet his teaching responsibilities. He was grateful to be able to video-record an apology to his students. He was so adored and revered as a teacher and mentor that family and friends referred to him as “Mwalimu” (Swahili for teacher). Defining features of Mazrui’s intellectual legacy include courage and controversy. A principal theme of his work was to identify and criticize abuses of political, economic and military power, whether by colonial or imperial nations, including the United States, or by leaders of developing countries, including African nations. His original and bold ideas generated passionate debate on African and Islamic issues. Expressing those ideas took professional and moral courage, especially when his personal security was put at risk. While he was still living in Uganda in 1972, for example, he released a widely circulated essay entitled “When Spain Expelled the Jews and the Moors,” an unmistakable criticism of Idi Amin’s expulsion of Ugandans of South Asian origin. In fact, during Mazrui’s tenure at Makerere, he gave several public lectures that criticized Presidents Milton Obote and successor Idi Amin for violations of human rights and the rule of law. Additionally, while he was critical of Salman Rushdie’s 1988 novel, The Satanic Verses, Mazrui was one of the few famous Muslims to publically oppose the Ayatollah Khomeini’s fatwa calling for Rushdie’s death. These public stances could have cost him his life. Mazrui also risked his reputation, even when not his life, by taking positions of principle that generated sharp criticism and condemnation. For example, his long-standing criticism of Israel (not Judaism or Jewish people) for its treatment of Palestinians provoked some pro-Israeli critics to challenge Mazrui’s character; label him (falsely) as anti-Semitic; impersonate him as the author of hateful communiqués; subject him to leaflets that used racial epithets while demanding the termination of his employment; and shut down, through concerted e-mail traffic, the ability of his institute to access the internet. His argument in favor of nuclear proliferation, whereby all countries could obtain nuclear weapons so long as any country could, was denounced by some as irresponsible and dangerous. He insisted, however, that the most effective way to persuade the current members of the “nuclear club” to agree to universal disarmament was to allow other countries they did not control to pursue the power of nuclear threat. His 1986 television series, The Africans: A Triple Heritage, won praise around the world, including by members of the US Congress in statements published in the Congressional Record. It also generated strong criticism, however, such as by other members of Congress and by the head of the National Endowment for the Humanities, who condemned the series as an “anti-Western diatribe” and withdrew the agency’s name from the program’s credits. Ironically, the series was also banned for many years in Mazrui’s native country of Kenya, not for being too anti-Western, but for being too anti-African. Arthur Unger, a reporter for the Christian Science Monitor, wrote during the airing of The Africans that when he told Mazrui that he disagreed with many of his opinions but found the ideas challenging, Mazrui replied, with a smile, “Good, … Many people disagree with me. My life is one long debate.” For an account of some of Mazrui’s most prominent and controversial debates, see the multi-volume series, Debating the African Condition: Ali Mazrui and His Critics (2003, Vol. I), (2004, Vol. II), (2013, Vol. III). Those close to Mazrui loved him for his character and personal qualities. His warmth was enveloping and his laughter was infectious. He was endlessly generous toward family, close and extended, and to people in less fortunate circumstances. He was gracious to all, including strangers and intellectual adversaries. The hospitality of Mazrui and his beloved wife, Pauline, drew hundreds of visitors to their Vestal, New York home from across town and the world. He also kept in touch with relatives, friends and colleagues in far off places with a personal newsletter that he wrote annually for nearly forty years. He enjoyed learning from people from all walks of life and cultures. An egalitarian and humanitarian, he endeavored to treat all people with respect, dignity and fairness. At the same time, he valued spirited debate about political, economic and philosophical ideas. Mazrui modeled integrity and decency. Mazrui is preceded in death by his parents Sheikh Al-Amin and Swafia Suleiman, his brothers Muhammad and Harith, and his sisters Salma, Nafisa and Aisha. 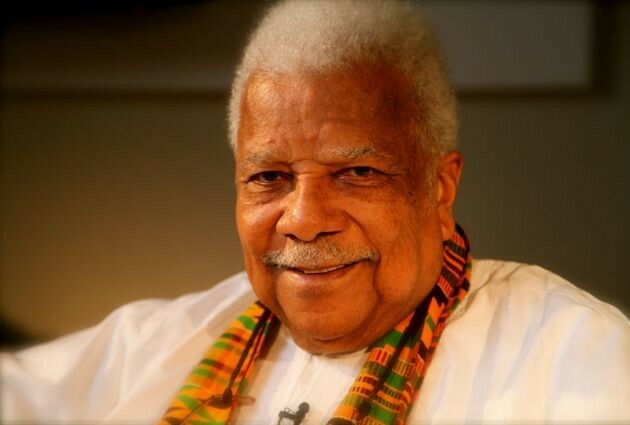 He is survived by his wife, Pauline Uti Mazrui; five sons: Jamal Ali Mazrui (and wife Susan) of Takoma Park, Maryland, Alamin Ali Mazrui (and companion Rosalind Holden) of Binghamton, New York, Kim Abubakar Ali Forde-Mazrui (and wife Kay) of Charlottesville, Virginia, Farid Chinedu Ali Mazrui of Vestal, New York, and Harith Ekenechukwu Ali Mazrui of Vestal, New York; and by his daughter, Grace Jennifer Adaobi Ali Egbo-Mazrui. He is survived by three grandchildren: Will Nielsen Forde-Mazrui of Winston-Salem, North Carolina, Ali Alamin Mazrui of Vestal, New York, and Nicole Molly Mazrui of Takoma Park, Maryland. He is also survived by the close and long-time members of his Vestal home family: “Mama” Alice Uti, Goretti Mugambwa, and Maria Liverpool. He is survived by his sister Alya of Mombasa, Kenya, and by numerous cousins, nieces and nephews. Mazrui will be buried during a private service in the Mazrui Cemetery near Fort Jesus, Mombasa, Kenya. For information about open events that will celebrate his life and work, see the memorial website [URL]. The family requests that expressions of sympathy take the form of contributions to the Prince Alwaleed Center for Muslim-Christian Understanding at Georgetown University, Washington, DC, USA. One place to continue conversation about the life, works, and significance of Ali Mazrui is the Facebook page hosted by his family: www.AliMazrui.com. The Institute of Global Cultural Studies (IGCS) was founded by Professor Ali A. Mazrui in 1991 at Binghamton University, State University of New York. Original poster is not very knloeldgeabwe about guns and ammo.Neither 9mm nor 357Sig rounds of any type can compete with the kinds of loads that are possible in 357Mag.The Coonan is a great idea for many reasons.